​The MDG are sponsoring an award for the Best Dexter Young Handler. Mike & Sue Bancroft will be attending to present the award. The MDG are again funding a prize for the Best Home bred Dexter. Rob & Alison Kirk will be attending to present the winners with a cheque for £50. To be judged by Silke Warneke, 2019 President of the Dexter Cattle Society, over 3 days - 16/17/18 August. Class details TBA. Following the success of their BBQ last year Mike & Sue Bancroft are again hosting a BBQ at their home, in Stratford on Avon. to be held in the Ombersley area, near Kidderminster. Details when available. The £50 for the Best Home Bred Dexter was won by Tooloos Freesia, the Dexter Champion, bred by Les & Abbie Digweed. Congratulations to the Tooloos Herd. ​The £50 for the Best Young Handler - Showing a Dexter was won by 5yr old Hugh Roberts from Winterbourne, Worcs, showing a Dexter calf borrowed from Pam Weaver. The herd currently comprises 23 animals, 22 of which are non-shorts. As well as rearing animals for beef, David has sold and hired out several bulls, one of which is currently on AI in Ireland. All his animals are halter trained and quiet to handle. The land is very shallow sandy soil and has a limited capacity for producing crops and fodder. For several years he has been using the “Better Grass System” which improves the availability of minerals and trace elements through the grass rather than through buying in mineral supplements. For those who would like to stay for lunch, we recommend proceeding to the Green Man Kenilworth - a very short drive from the farm visit. As you come into Kenilworth, it is on the left opposite a garage. Members to place their own orders and pay. 12:15 - 12:45 Description of the "Better Grass System"
The Lecture commencing at 11.30, will include the Rare Breeds Survival Trust's efforts to maintain a gene bank for endangered breeds of livestock & other projects of interest. Lunch: Approx 12.30 - Members please bring lunch table contributions as usual. On 9th December 2018 we held our AGM at Welford on Avon Bowls Club, near Stratford on Avon. 23 Members (including a new member) attended to find ideal facilities with a well stocked bar next door!!! Once the serious business was over the Committee members provided lunch, consisting of various Dexter beef casseroles, followed by fruit crumble & custard. All agreed it was a jolly good lunch & a skittles match ended the event. Next year, we will be needing new committee members as our Secretary: Malcolm Eykyn, Treasurer: Rob Kirk & Chairman: Mike Bancroft have all indicated that they will be retiring. This gives members plenty of time to volunteer for office. THE GROUP CHAIRMAN’S END OF SUMMER B.B.Q. On Sunday 16th September, Mike & Sue Bancroft hosted the Chairman's end of Summer BBQ at their home in Stratford on Avon. Mike did an admirable job cooking members choice of meats & Sue provided a super selection of salads, which were followed by members pudding contributions. This was a purely social occasion, held in Sue & Mike's lovely garden, & all who attended enjoyed exchanging news & views, interspersed with much laughter. Thanks go to Mike & Sue for their hospitality. Mr Nick Deverell-Smith our guest speaker for the evening, is the proprietor and Head Chef of The Churchill Arms, Paxford, winner of Junior Chef 2000 & has also been a guest on TV's Saturday Kitchen. The 40 odd people in attendance included Paxford Village residents, & Malcolm Eykyn gave a brief history of the Dexter & an insight into the recent discoveries by Professor Mike Lee that grass only fed beef is a rich source of healthy minerals, vitamins & essential fats, This hopefully is good news for Dexter beef producers, as our beef is already known to be low in cholesterol, & it may increase demand for our product. Nick then demonstrated how to cook the perfect Dexter steak....which was delicious, of course! This was followed by the tasting of MDG members pre-cooked beef dishes, using lesser known cuts of Dexter beef. 9 gallant cooks "stepped up to the plate", contributing an interesting selection of dishes & the winner by a "short head", as judged by Nick Deverell-Smith, was Carol Beasley. Congratulations to Carol, whose reward was a complimentary meal for two at Nick's restaurant - the Churchill Arms in Paxford. We are most grateful to Nick for his time, & generous complimentary meal donation to a very interesting meeting. ​On Sunday 8th July 2017, 17 MDG members went on day trip to Steve & Sharon Adcock’s Higher Parkhead Farm, Ipstones Edge, Staffordshir, home of the Toadhole Dexter Herd - & from where they run Moorlands Fine Foods. www.moorlandsfinefoods.co.uk is well worth a visit, if only to watch Steve’s video which encapsulates his approach & the attractions of "DEXTERS" perfectly. The farm is home to 53 Dexters situated high on the Staffordshire moors, with typical moorland grass & rush grazing, surrounded by gritstone walls & some fencing. There are wonderful panoramic views, including across the Churnet Valley to The Wrekin & Welsh hills. Some compensation, maybe, for the harsh conditions Steve & Sharon experienced in the winter of 2017 & the extremely dry conditions this summer, which have resulted in Steve carrying water to the stock in some fields which are usually wet.... with a drinking pond! Despite this, all the stock looked extremely well & were thriving. Following the farm walk we were treated to superb lunch, cooked by Sharon, of Moorlands Fine Foods produce……delicious. After lunch, Sharon showed us around her butchery room & kindly allowed members to make their own burgers to take home, which was most entertaining in some cases!! As if this was not enough, Sharon then produced a magnificent afternoon tea. All homemade cakes, served on some of her beautiful bone china collection, which totally outshone the “Dobbies” version of afternoon tea. This was greatly appreciated by the MDG members who are known to enjoy good food. We are most grateful to Steve & Sharon for their hospitality & entertaining us so “royally”, it was a trip well worth the journey. Members then had the opportunity to handle the cattle & ask questions. After lunch at the Village Hall, Mr Edward Hicks (an arable & livestock farmer) talked about selecting store cattle to suit his farming system, utilizing straw from the arable side & grazing land unsuitable for arable production. 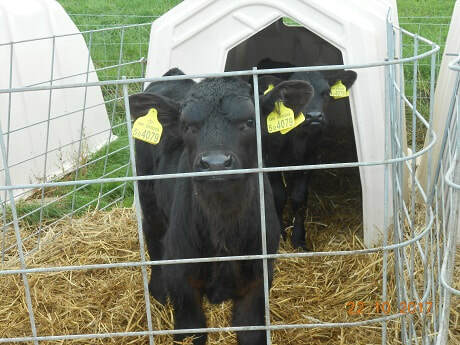 Buying young store cattle in the Autumn & housing them for the Winter @ a cost of £1.30 per animal per day. Cattle are then turned out in the Spring to graze ridge & furrow fields before being sold for “finishing” late Summer/early Autumn. The manure produced during the Winter housing period is spread on the arable land, adding additional value to the land & reducing fertilizer costs. ​All agreed it was very worthwhile & practical meeting, & special thanks go to Rob & Alison’s cattle, for allowing members to prod & poke them!! The 2017 Herd Competition winners were announced at the AGM held at the White Hart Hotel on 14th January 2018. The 2017 competition was judged by Mr David Benson, a Charolais cattle man, who unfortunately could not attend the rescheduled AGM, so the Trophies were presented by Mike Bancroft. CONGRATULATIONS to all the winners, but special congratulations must go to Anne & Annette North for winning the Small Herd Trophy for the second consecutive time, as well as winning the Senior cow & Best calf awards for 2017. The photo competition was won by David Williams, 2nd was Phil & Jo Smith & 3rd was Mike Bancroft. ​Following the Chairman & Treasurer reports, the committee for 2018 was elected (details on the "About us" page) & various ideas for future events were put forward. The meeting concluded with a buffet lunch supplied by the White Hart. May 2018 - to be confirmed. 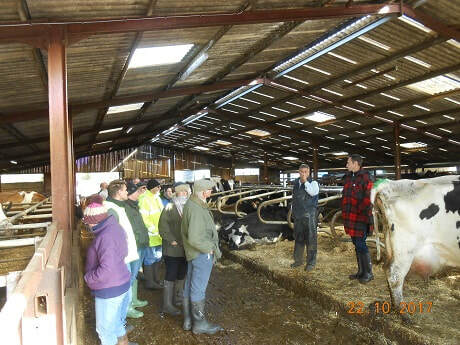 On Sunday 22nd October a group of 24 members visited James Appleby's Organic Dairy Farm at Bretforton, Worcs. 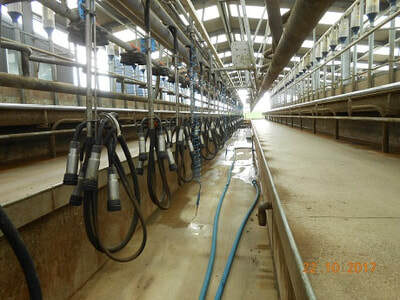 We were met by James at the purpose built 50/100 parlour, where 500 cows can be milked by 3 people in an hour & a half. 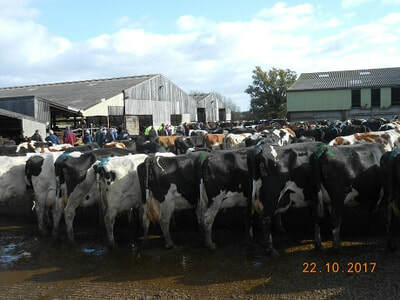 Outside the parlour we visited a very happy bunch of calves, housed in calf hutches until weaned. We then travelled to the farm yard to view the buildings, & site of the original parlour, which have now all been converted to cubicle housing. It was quite a sight to see such a large number of cows in one yard. They were very quiet cows of mixed breeding, who were totally unfazed by 24 strangers wandering amongst them! 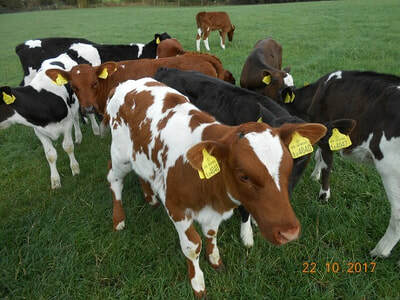 Finally we saw an extremely friendly group of weaned heifers calves in a neighbouring paddock. Lunch was at the village hall in Bretforton, where James kindly surprised us with tubs of delicious Spot Loggins Ice cream, made by his family from his organic milk. Thank you James for a lovely informative visit. ​as many members had never witnessed an Assessment before. Our visit culminated in Stephanie putting on an amazing spread of food for us all afterwards. ​Thank you so much Steffie . Sadly our Group Meeting at Wasperton Farm was not a day for hearing bird song, The weather was cold & wet, but that did not deter 15 or so hardy Midland Group members from attending! We saw many birds sheltering & feeding on the sorghum, millet, quinoa & thistles included in the plant strip mixes. Matt Wilmot, from Natural England, informed us about the seed & pollen mixes, the birds they attract, the costs & payments available under the various schemes. Following the walk, we adjourned to the Pub to warm up with a welcome lunch & further discussions, including the future of the schemes post Brexit. Our thanks go to Matt Wilmot, who kindly gave his time on a wet Sunday morning & to Val & Malcolm Eykyn - our hosts. MDG members Les & Abbie Digweed & Pete Gardner, of the Tooloos Herd, won the Dexter Cattle Society's Bertodano Shield for "the Herd gaining the most points over the show season" & The E H Peyton Trophy for "the exhibitor of the Female gaining the most points over the show season " with Langley End Morisia. The Cannington Perpetual Trophy - For Junior Handler was awarded to junior MDG member Miss Lois Taylor, a member of the same family. Huge CONGRATULATIONS to all involved & what a fantastic year you guys have had. On Sunday 4th December, we held our AGM at Hardwicke Village Hall. There was a lower than usual turnout, but all the usual business AGM busines took place & the 2016 committee was re-elected for a further term in office. A "seasonal fayre" themed lunch was contributed by members & was, of course up to the legendary MDG standard. The Christmas cake seemed very popular, as can be seen in the photograph!! It is proposed that the 2017 AGM will be held in Moreton in Marsh followed by a Christmas lunch, which is popular with members. Mike Bancroft reported that the Midland Group will be sponsoring the Young Handler & Best Home-bred Dexter classes at 2017 Three Counties Show. The 2017 programme of planned events is listed above in "DIARY DATES for 2017" & further details will be published when available. On Sunday 4th September 2016, members visited the Kingsbank Herd, winners of the 2015 MDG Small Herd Competition, by kind invitation of Ann and Annette North. We were introduced to Julius Marstrand, past Chairman, Friends of Leckhampton Hill & Charlton Kings Common (otherwise known as FOLK), who gave us in insight into the management of Leckhampton Hill and the invaluable work Ann and Annette’s cattle are doing as regards conservation grazing on the Hill. The Hill and Common are on the edge of the Cotswold escarpment and located on the outskirts of Cheltenham. Friends of Leckhampton Hill & Charlton Kings Common has over 100 members, including a number of regular volunteers who work alongside Cheltenham Borough Council (CBC), the site’s owner, to manage and promote the use of the Hill and Common. FOLK have a strong influence on the management, use and future of the site, which is in an Area of Outstanding Natural Beauty (AONB). We then drove up to the Hill to be met with superb views across the valley and surrounding areas. As we walked along the top of the Hill, Julius pointed out several interesting places, which had been designated as Sites of Special Scientific Interest (SSSI) due to the biological interest of the unimproved grassland and for its geological exposures. Historical features on the Hill include an Iron Age hill fort and long barrow. Old tramways criss-cross the hill from the days of limestone quarrying and the remains of kilns and quarries are still very much in evidence. As we approached the cattle, it was noticeable how quiet they were, even with the general public walking through them. Annette gave us in insight into the breeding of the cows and their management. Annette’s brother, John Paul, explained how he uses a solar panel to provide power for his electric fencing unit. What a brilliant idea! We then went to look at a group of young cattle and Annette explained their management. The cattle were all halter trained, which helped with the movement from one site to another. At that point it was time to return to the scout hut for our usual hearty MDG lunch, where Julius Marstrand completed his talk and members were able to ask questions. It was a most enjoyable day and we saw some lovely cattle. Thank you Ann, Annette and John Paul. Sadly total cattle numbers were down on last year, but this was probably be due to the weather prior to the Show & the TB restrictions many herds are enduring. Congratulations on a VERY successful show, go to the Gardner/Digweed/Taylor family with the Tooloos herd. The photo (above) is Lois Taylor with Langley End Morisia (Champion Dexter) & her baby. 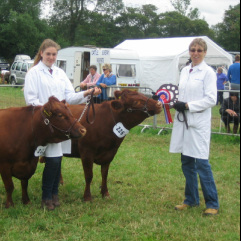 Well done Lois, on your 2nd place in the 13 years & under Beef Young Handlers class - a splendid result. The Midland Group Dexter trophy was awarded to the Tooloos Herd & Langley End Morisia. ​On a beautiful sunny Sunday in June, 30 Midland Group members visited the Watchbury Herd, winners of the MDG 2015 large herd competition, by kind invitation of Val & Malcolm Eykyn. Watchbury Farm is idyllically tucked away in the in the Warwickshire countryside, near Barford. Malcolm warmly welcomed us, & over coffee explained how the herd is managed in conjunction with the HLS Countryside stewardship scheme & introduced Mike Robinson from Natural England. Mike accompanied us on the Farm walk & provided interesting information on the costs & benefits of beetle banks, pollen & nectar areas & wild flower meadows. All of which contribute to a thriving eco balance on Watchbury Farm, & many of us would be delighted to see so much potential fodder in our own fields. talk on BVD & Johne's disease in cattle. The speaker was Vet Steve Borsberry from the 608 Vet Practice at Rowington, who explained both ailments superbly, with the aid of slides, "cuddly toys", & MDG member, Gemma. Gemma valiantly took on the role of a "bovine" in demos that enabled us, as Livestock keepers & not Scientists, to readily understand how infection & immunity are passed between animals. The role of vaccines was discussed as both BVD & Johne's are serious problems in commercial cattle herds. Members were advised that their own Vets were best placed to devise a strategy applicable to individual herds, as the problem does not appear to be common amongst Dexter herds at the moment. Lunch followed the talk, with a delicious assortment of dishes, supplied by members as usual. Following the resignation of the Groups' Treasurer & Secretary, Sue Bancroft agreed to take on the role of Treasurer & Malcolm Eykyn was elected Secretary. The Group Chairman expressed grateful thanks to Kathryn Wheeler & Amy Taylor for all their hard work, on behalf of the Group. Following their success as our 2015 Small herd winners, MDG members Ann & Annette North have been featured in the Gloucestershire Echo. Congratulations to them both, as it is a lovely article with some great photos of their cattle on Leckhampton Common. It is also good publicity for our beloved breed, & their versatility as "Conservation Grazers". 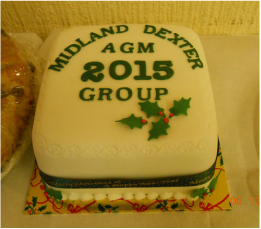 ​On 6th December 28 Members attended the Midland Group 2015 AGM at Stoneleigh Village Hall. A new committee was duly elected & various ideas for 2016 were discussed. Congratulations to MDG junior member Miss Lois Taylor on winning the DEXTER CATTLE SOCIETY's Lisa Kemmish Trophy awarded in recognition of the under 12 year old accomplishing a standard of merit during 2014/2015. This was presented at the Dexter Cattle Society's 2015 AGM, organised by the Midland Group & held at Chipping Campden in October. Special thanks were given to co-opted committee member Mrs Jane Gardner for her sterling efforts in making the 2015 Dexter Cattle Society's AGM event such a success. 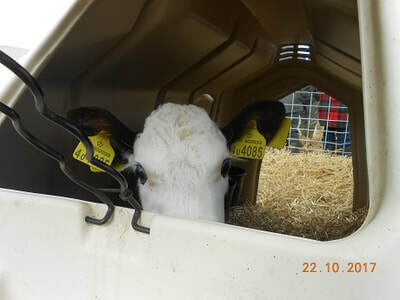 The photo competition, judged by Mrs Sue Bancroft, was won by Miss Elizabeth Wheeler with a cheeky calf photo which epitomized the character of our breed! It was a lovely informal meeting with the usual MDG "legendary spread" on the Buffet table, which was heartily tucked into at the end of the Meeting. CONGRATULATIONS to the Winners & grateful thanks to Judge Mike Bancroft & his "Chauffeur" Liz Wheeler for their services. Congratulations to Abbie & "Dig" on the safe arrival of baby Thomas, the youngest attendee aged five weeks. Well done Thomas on your impeccable behaviour & starting so young!! The power of chance to shape our lives never ceases to amaze me. The “bad” luck befell my friends, and fellow Dexter breeders the Poole’s, who tested four steers for a new customer - which should have been routine. Sadly one animal failed the test & their misfortune turned into my “lucky break” as I had just passed my annual test. The disappointed buyer of the Poole’s four steers was Ellie Harrison, a presenter on the BBC’s ‘Countryfile’. Ellie did not want breeding animals, just a few to graze a Conservation orchard. Ellie & her family came to visit my herd & chose 3 steers & a heifer whose friendly disposition…….ensured her selection! I was quite happy to deliver Ellie's cattle as she doesn't live that far away, but I was not surprised when she asked if Adam Henson could have that job instead and film the process as part of the ‘Adam’s Farm’ slot for ‘Countryfile’. My contact with ‘Countryfile’ was Dan the cameraman, a dairy farmer’s son & his task was to choreograph a story. Filming took place six weeks after Ellie’s visit on a very wet August Bank Holiday. The cattle sensibly took to the hedges to escape the rain but the miserable weather meant they were hardly looking their best. On the plus side when they were ready for me there was no messing about with make up or fancy costumes - just my regular, muddy wellies, my old hat that scarcely leaves my head and a 35 year old Barbour! Walking and talking, even in the comfortable surroundings of my own land proved extraordinarily difficult with a camera pointing in my direction! However, Adam and his crew were very easy to get along with and I quickly relaxed and started to get the hang of this filming lark! Eventually after various re-takes we made our way back to the yard to load the cattle & I handed over the paperwork & that was that. 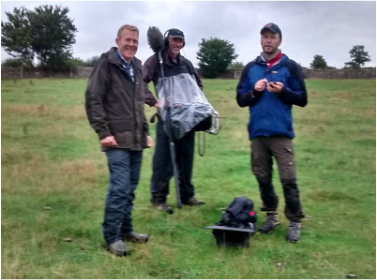 Inevitably, much of what we talked about never made the final edit & watching the finished item on 'Countryfile' at the beginning of October, the final result did seem very short considering the hours spent filming. However I hope that Ellie enjoys her Dexters, as they certainly looked perfectly content exploring their new home. 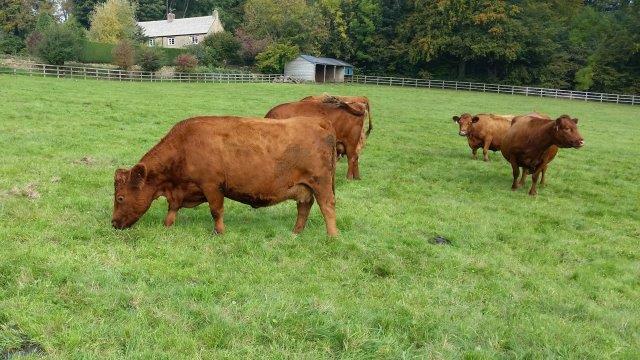 On Sunday 11th October during the Society AGM weekend Rob and Alison Kirk hosted a herd visit to their Boram Dexters. They welcomed seventeen members from Germany and the UK, including the contingent from Scotland and Cumbria, Yorkshire, Wales, Somerset, Oxfordshire, Bedfordshire and Kent. 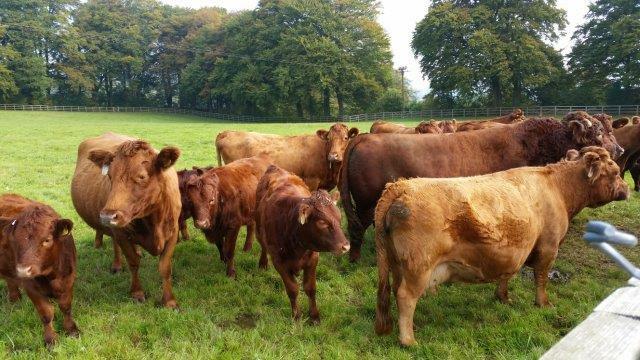 The weather was perfect for such a visit and after a ‘meet and greet’ by Rob at Hill Top House, Sezincote, everyone walked across the fields to meet the Boram red cows with calves at foot, running with Boram Red Kite. The cattle came to the gate to meet everyone, thoroughly enjoying having their photographs taken and being admired. After much discussion and questions about the red herd and also the specially made steel tripod holders to stop badgers getting into mineral buckets, everyone made their way to Barton Home Farm, Barton on the Heath. Animals are now being housed and the visitors discussed at length the 22 month old Dexters being fed on red clover silage, three young bulls in the main building and a group of weaned late autumn 2014 born calves, in another building. It was then time to see the autumn calving cows out at grass, due to begin calving very soon, followed by a group of 18 month old steers and heifers. By the time everyone had walked back across the fields to the buildings, it was now almost 1 o’clock and no time left to visit the spring calving cows, some 12 miles away in the hills above Charingworth. Rob and Alison invited everyone to Harcomb Cottage for tea and biscuits, where discussions about all things Dexter continued. Their guests then left for the Tooloo’s Farewell at Chipping Campden before the homeward journey. A big thank you to all who visited Boram Dexters. Many of you may not know that I was diagnosed with Parkinson's disease two years ago, which precipitated the move from Church Farm, a year earlier than planned. Having joined Parkinson's UK I wanted to do something to raise funds for them, so decided to participate again in the Sponsored Walk that they organise each year. This year there were 7 of us taking part in our group - all family members. The walk took place on 6th September & was a six mile circular route, starting & finishing at Packwood House - passing through Baddesley Clinton - & we completed it (including an all important Loo break!!) in 2 hours 10 minutes. We were lucky with the weather & Sue met us at the finish, with a lovely picnic, which as the photo shows, we enjoyed whilst we wound down! I raised a total of £210, & I would like to thank all the MDG members who sponsored me whilst I was judging the Herd Competition. In all 120 walkers completed the circuit, & it will be organised again next year, so if any MDG members want to join me to raise funds for Parkinson's UK's valuable research, please let me know. Messrs P & A Gardener, wasTooloos Aubretia. Once again the Midland Dexter Group held their show classes for MDG members at Hanbury Show. It was a perfect day for showing & there were 114 cattle, of different breeds, present at this year's Show. This is a significant increase in cattle numbers on last year, & an indication of Hanbury Show's success in attracting entries & visitors. The largest number of entrants were for the Dexter classes, of course! The MDG had their stand there, kindly manned by stalwart group members David Williams (with collie dog, Bo, for company) & Alison Kirk. The MDG are most grateful to the Hanbury Show Committee for including our classes in their schedule, & special thanks go to George & Sue Godber for organising all the Cattle classes so efficiently. MIDLAND GROUP NEWLY WED SHOWING FANS, LES & ABBIE DIGWEED, SPREAD THE DEXTER WORD AT FORT WORTH STOCK SHOW, WHILST ON HONEYMOON IN USA!! The Group is planning to hold the Herd Competition in 2015, so watch out for further details. It was announced that the Midland Dexter Group will be hosting the National Dexter Cattle Society AGM, in October 2015 & ideas for venues & events to take place during that October weekend, were briefly discussed. This is a big undertaking for our group, so if any MDG member has any suggestions, or would be willing to help with organisation of the Event, please contact us at midlanddextergroup@gmail.com . Also, we are looking for MDG members willing to play host to any DCS members, attending the AGM, wishing to visit herds in the area. Please contact any Committee member or email midlanddextergroup@gmail.com, if you can help. 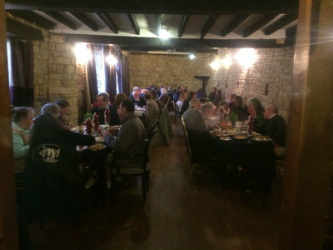 Following the close of the meeting we all strolled down the High Street to the Lygon Arms for a delicious lunch & a well earned, bit of socialising. On Sunday 28th September we were blessed with a beautiful day for our visit to Mike & Nikki Ford's Castlemoor Herd at Newent, in Gloucestershire. There was a marvellous turn-out of 45 members on the day, & after coffee & biscuits, we set off to view the cattle. Mike & Nikki specialise in Red dexters & (once the cattle had got over the initial shock of the 45 members invading their fields!) we were able to view mainly red cattle, with a few black's for variety, along with their 2014 calves & their 2 stock bulls, Moonshine Declan & Holberrow Red Roy. A good show of strong, healthy cattle, we all agreed. We then returned to the Ford's garden for a Dexter burger BBQ, kindly supplied by Mike & Nikki. As usual, members supplied a wonderful selection of salads & "puds" & we all sat down to lunch & "good gossip". Our grateful thanks go to Mike, Nikki & their children, Katie & Jamie, for a lovely day. Our MDG Committee Chairman, Les (Digger) Digweed & Abbie Gardner, committee member responsible for the Group's Shows/Showing Events, got married on 22nd August 2014. Congratulations & best wishes go to them, for their future together, from all MDG members. 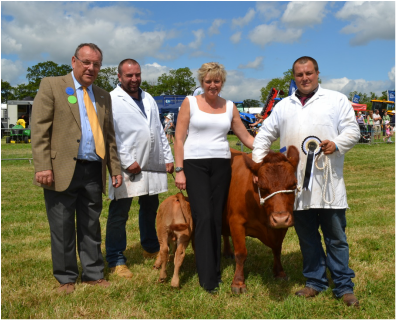 Those members who attended the Hanbury Show in July were treated to an excellent turnout of 30+ Dexter Cattle, shown by Dexter owners from as far away as Yorkshire, Bristol & Northamptonshire. The Dexter classes were judged by Mr Bernard Stamp, from Exeter, & he was presented a splendid selection of Dexter cattle to judge. The MIDLAND DEXTER GROUP CHAMPIONSHIP was awarded by Mr Stamp, to Jenny Lewis & her home-bred red heifer, Biddlesden Olympic Gold. Congratulations to Jenny! 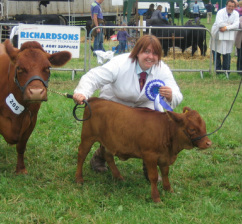 The RESERVE CHAMPIONSHIP went to a cute red baby heifer Tooloos Freesia, shown by Abbie Gardner. Freesia's got her showing career off to a great start! In all there were 70 odd cattle of various breeds on display. The weather was kind on the day & everyone enjoyed themselves. The Midland Dexter Group's special thanks go to George & Sue Godber, on the Hanbury Show committee, for their superb organisation of all the Cattle classes & allowing the Group to hold their Championship classes. Congratulations go to LOIS TAYLOR our youngest member, who won the under 8 years old Dual Purpose Young Handlers class, on both the Saturday & Sunday of the Royal Three Counties Show. She also came 3rd overall in the Championship against much older competitors. This young lady clearly has a promising future in the Cattle Showing world! WELL DONE LOIS. ﻿ A most instructive visit was enjoyed by Group members, who learnt that DFL Trifolium Seed Company are a Danish Company & Denmark is the main producer of Grass seed in Europe, as it is a crop which suits the Danish climate. On the Winchcombe site they can have as many as 2500 grassland plots at any one time & it can take as long as 25 years for a new variety of Grass seed to reach the retail market. On a walk around the trials plots we learnt that they apply as much as 350kg per hectare of 60:20:20 fertiliser throughout the growing season!! Another interesting fact discovered was that in a bag of clover seed as much as 1/5th of the seed can be dormant for as long as five years, hence why clover seems to grow better in some years than others. We were also advised that the average field should be re-seeded every 4 years & the cost of the seed would be "paid" for by the improvement in the grass crop. All agreed it was a most informative & enjoyable visit & if sufficient members are interested a follow up visit will be arranged. A Panel Discussion & Open Forum: Improving Dexter Beef Sales & Marketing was held on Sunday 16th March at Weston-sub-Edge Village Hall, Evesham Rd, Weston-sub-Edge, Glos, GL55 6QH on a beautiful spring day, which was a distinct bonus! The subject of being able to sell our Dexters, either for beef or breeding, at the best possible price, was clearly a popular subject as 60 members attended. Each panel member gave a brief presentation & then answered questions from the floor. It resulted in a most interesting exchange of views & information between members, & the panel, & provided further "food" for thought for all of us. A follow up session is being planned. The meeting was followed by a super lunch of jacket potatoes with Dexter beef chilli or cheese & beans, with a selection of salads & puddings all contributed by Group members. After post lunch socialising, fully replete members left the meeting to "digest" all that had been discussed! There was an excellent turnout of 50 people, representing 28 herds from the West Midlands areas, for the AGM held at Chipping Campden Town Hall on 24th November 2013. Following the meeting 43 members strolled down the High Street to the Lygon Arms Hotel for a superb roast beef "Christmas" lunch. Although the beef was not "Dexter" beef, the quality & quantity of food was excellent & we hope to visit again next year.